Olympia LePoint provides “Your Brain Master Class – Unleash A Genius Mind.” LePoint coined the term Triabrain in her writings on The Huffington Post and created the Trianbrain Theory of Relativity in her self-help book, Answers Unleashed: The Science of Unleashing Your Brain’s Power LePoint created the Triabrain Theory of Relativity as a method to explain how she rewired her brain to overcome painful memories and succeed. She shows leaders how to do the same. The Answers Unleashed LIVE Lecture debuted at California State University Northridge to a sold-out audience. The show is based on Olympia LePoint’s new science book Answers Unleashed: The Science of Unleashing Your Brian’s Power with foreword by neuroscientist Dr. Jeffrey M. Schwartz, and endorsed by retired NASA Astronaut Robert Curbeam. In the lectures, she coins the term brainbrink, a term that she created to represent how her brain stalled and disconnects her from success. She shows audiences how to reconnect your thinking to launch to your success! From the ages of 21-30, Olympia LePoint was one of the youngest leaders to help launch NASA’s Space Shuttle into success. Now she applies the same math and science – that she used to launch rockets to Mars – into explaining how her brain unleashed its power with the “Triabrain Theory of Relativity.” It uses Einstein’s Theory of Relativity and Chaos Mathematics to show mental success. Using Science, Technology, Engineering and Math (STEM) to understand connections. Why bring this success program to your event? Discover of how false thoughts about your life separate your brain into “brainbrink” and how these thoughts can block your brain’s solution finding power – your intuition, science innovation, lucrative business ideas, and educational success. Learn the sources of these thoughts, how to turn off the triggers from your past painful experiences, and reconnect your brain’s power through the “Triabrain” to change chaotic situations into your advancement. Develop heightened ingenious brainpower to launch your life into success through business innovation, personal intuition development, dream decoding, and clever use of your current resources. the information exposed in the new book Answers Unleashed. Hailed as “The New Einstein” by her fans, Olympia LePoint is not a neuroscientist or psychologist. Rather, Olympia LePoint is an award-winning rocket scientist who overcame horrendous early life challenges, and later applied her physics and mathematics to explain how her brain reshaped. 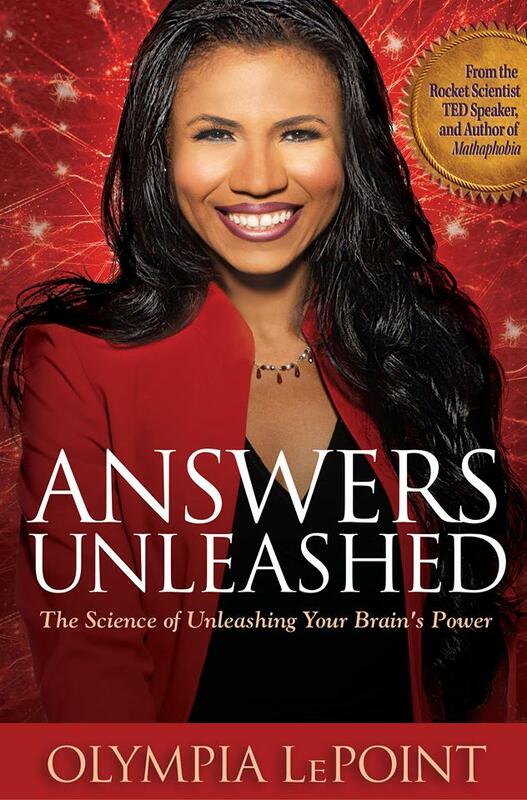 Through the “Triabrian” and “Triabrain Theory of Relativity” explained in her new book Answers Unleashed, LePoint explains how she used self-directed thoughts to overcome her painful memories to rise to success. The book identifies how others, who have gone through challenging experiences have the brainpower to do the same.